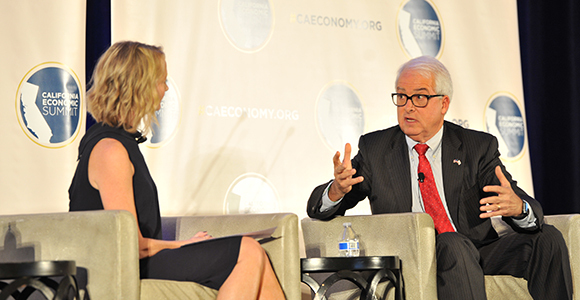 The California Economic Summit has been promoting a conversation among state leaders about how to lift millions of Californians who live in or near poverty into the middle class. The Summit has asked the major 2018 gubernatorial candidates to share their views. Republican John Cox of San Diego thinks solving the housing crisis in the state—which has been a Summit policy staple the last several years—must be addressed. I believe that there are two Californias – the one we have and the one we could have. Unfortunately, due in large part to the corrupting influence of special interest money contributing to the woeful leadership, Californians face record housing costs, cost of living, poverty, crime, taxes, economic stagnation, and an unfunded pension liability in the hundreds of billions. Winston Churchill once said, “I contend that for a nation to try to tax itself into prosperity is like a man standing in a bucket and trying to lift himself up by the handle.” To that end I am offering a plan for growth that relies not on taxation, but growing our resources through prosperity. State Treasurer John Chiang shared his thoughts in this commentary. We will share others as we receive them.